Although you have great vision straight ahead, have you noticed that you hit things off to your side because you cannot see them? Perhaps you have had a stroke or may have Glaucoma. You may need to get your Peripheral Vision checked with a Visual Field Test. What can you expect from a Visual Field Test? Your eye doctor will consider testing your Visual Fields if he or she suspects that you have experienced a loss of Peripheral Vision or have Tunnel Vision. Do you have an Eye Disease? Does Glaucoma run in your family? Do you find that you hit items off to the side because you do not see them? Do you find that night driving is especially difficult, more so than average? Do you experience transient loss of Peripheral Vision or other strange visual disturbances preceding a headache? The most common and widely used VF Test is Confrontation Testing by Finger Counting. It is a rapid screening VF test. Your eye doctor will have you count fingers he or she holds up in the periphery while you look straight ahead. This Test is suitable for identifying large defects in your Peripheral Vision but not sensitive enough to identify subtle defects. Many eye doctors have computerized screening VF tests which are more sensitive than Confrontation Testing. 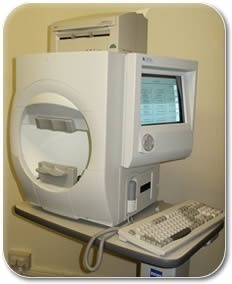 However, for more quantitative data, a computerized threshold Visual Field Test is best. A computerized VF Test will measure your visual sensitivity threshold amounts in units of decibels throughout your Peripheral Vision and compare the sensitivity levels to people of your age to see if your sensitivity is average or below average (indicating disease). These numbers can then be compared to your future testing results to determine if your condition is getting worse or staying stable. What can you expect from a computerized threshold Visual Field Test? You will sit in front of a large machine that looks like a bowl facing you. The machine will have a chin rest for you to place your chin. One eye will be covered and you will be asked to look at a central target. You are to keep your eyes steadily fixated on the target. As a matter of fact, if you look around and away from the central target, your VF Test results will be considered unreliable because you may have been using your central vision during the test instead of your Peripheral Vision. As you look at the central target, lights of different brightness or grating patterns of varying contrasts will flicker in your Peripheral Vision. Whenever you see the flickering objects, you are to push a button. This threshold VF Test is similar to the audiology test in which you have to press the button whenever you hear a sound. Sometimes the sounds are louder and other times they are very faint. Similarly, sometimes the objects you are looking for in your Peripheral Vision are brighter and sometimes they are very dim during this test. After you have completed the test in the right eye, you will complete the test in the left eye. When the tests are finished, the machine will print out a summary of the results and Visual Field defects will be apparent in each eye. Whenever defects appear, your eye doctor will often have you repeat the test to make sure that you understood the test and to verify whether you indeed have the defects. Once documented, your Visual Fields can be tested annually or more frequently, depending on the extent of the damage, in order to track for progression of disease and any further deterioration of your Peripheral Vision.